This recipe was inspired by a recipe for Chocolate-Almond Pastries in the December ’09 issue of Martha Stewart Magazine. I gave it new life by using hazelnuts and Nutella. It’s a versatile recipe–you could easily use any combination of nuts, dried fruits, and chocolates. Next time I make it, I’m going to add a few dollops of Mascarpone cheese to finish it off. Preheat oven to 45o F. Arrange puff pastry on a parchment-lined baking sheet. Form a 10-inch square and fold each edge in to make a 1-inch crust. Poke middle of dough numerous times with a fork. Brush edges of dough with egg wash and sprinkle with sugar. Freeze for fifteen minutes. Transfer baking sheet to oven and bake until pastry is puffed and golden brown, 15 to 20 minutes. 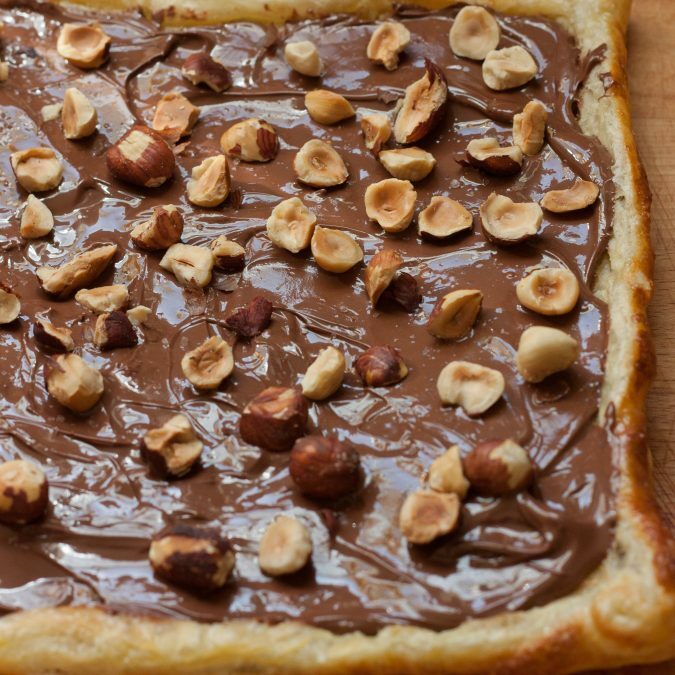 Remove from oven and spread Nutella evenly across the pastry. The Nutella will begin to melt, making it much easier to spread. Sprinkle with sea salt and hazelnuts and cut into 4 squares or 6 triangles. Serve warm.